Do not press the start button. Take a deep breath. Savor the craftsmanship. Take it all in. Begin by examining the four brightly-polished organ-stop vent plungers. The stainless steel knobs situated high on the dashboard are easy to miss at a cursory glance. However, each is tasked with the important role of shutting down airflow from one of the bulls-eye air vents. Decades ago, the smooth metal rods would have been connected directly to the mechanical flapper. Today, with the physical connection severed by technology, a series of electronic micro switches sends orders to digital servos that handle the job. Understanding the tactile significance of that age-old mechanical movement, Bentley engineers painstakingly replicated the gratifying feedback of a precisely polished steel rod sliding over smooth felt to pull a soft leather damper closed. Their accomplishment is all but flawless. Tasked with building an all-new flagship that captures the essence of the Bentley marque – incomparable coach-built luxury and a passion for power and speed – the engineers and designers in Crewe left nothing to chance. 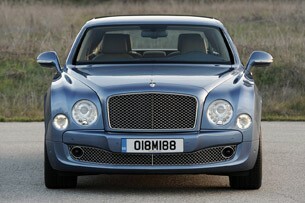 The result is the 2011 Bentley Mulsanne. Now... press the start button. Electronics manage nearly every aspect of the Mulsanne's venerable 6.75-liter V8, from the ignition sequence to fuel delivery. It systematically whirls to life and immediately settles into a near-silent idle. Unlike the Onyx-over-Saddle right-hand drive model we drove in the UK last year, this North American-spec Mulsanne wears Pale Sapphire paint over a Cashew interior (with French Navy contrasting color). 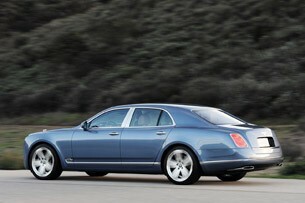 The base price on all models is $285,000 (plus $2,595 destination), but a standard Mulsanne is unheard of. This particular model is fitted with a smattering of options, including 21-inch two-piece Polished Sport Wheels ($6,315), Naim Premium Audio ($7,415), Seat Ventilation & Massage ($3,000), Burr Oak Veneer ($4,630), Adaptive Cruise Control ($3,270) and a Flying 'B' Radiator Mascot. Add in several more thoughtful touches, such as Ambient Interior Mood Lighting ($390) and a Valet Key ($250), and the bottom line on this magnificent beauty is a bold $330,195. Let us reassure you that the 2011 Bentley Mulsanne is worth every single copper-plated zinc cent of one-third of a million dollars. Wrap your hand around the polished stainless steel door handles (the insides have a tactile knurling to delight fingertips) and give it a firm tug. The door glides open, and the interior aroma spills out with it like the intense bouquet of a fine wine. 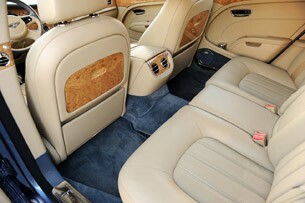 Bentley reinstated its traditional tanning process for the hides within the Mulsanne's cabin. The result is a rich and aromatic leather balm, distinctly different from the synthetic "painted" leather smell in most automotive interiors. 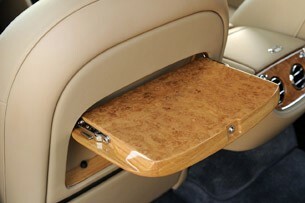 The cabin is lavish and sumptuous, both driver-focused and passenger-pampering. The steering wheel isn't particularly meaty or sculpted, but the texture, feel and grip of the leather is so silken, it doesn't need to be. The twelve-way power-operated heated and massaging seats are as comfortable as your favorite lounge chair but devoid of excessive bolstering, and they offer overly generous fore-and-aft travel on their tracks. The vertebrae-liquidizing seat massage feature should be illegal while the vehicle is in motion – its rhythmic pulsations could render an insomniac on Red Bull unconscious at high noon. Primary instrumentation is clear, but the countless smaller "glass" buttons on the center stack and center console will require some familiarization (but so does your kitchen's spice rack). With the engine purring on the other side of the firewall, the eight-inch high-resolution screen awakens from its resting position behind a veneered panel in the center dashboard and displays an easy-to-read version of the Audi Multi Media Interface. But it's hard to tell. Bentley's are designed around the driver, but don't be fooled into thinking that passengers are relegated to anything short of International First Class. While the front passenger enjoys the identical accommodations as the driver, the rear passengers (two-plus-one accommodations) relax with eight-way power-operated heated and massaging seats with lumbar support and memory features. Not only are there four individual zones in the vehicle's climate control system, but the occupants in the rear are able to move the front passenger seat out of the way (as if the generous legroom simply wasn't good enough). The various controls are all smartly tucked out of the way inside the rear center armrest. 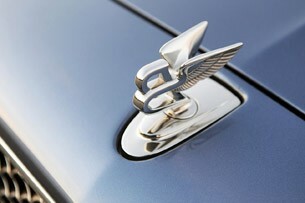 The aforementioned engine's basic architecture has been around since the 1960s, serving both Bentley and Rolls-Royce. No worries, as the famed "Six and Three-Quarter Litre" has been updated more times over the past several decades than Joan Rivers. Today, the all-aluminum engine has been completely reworked, fitted with new lightweight pistons, connecting rods and a forged camshaft. New control systems managing the twin-turbocharged engine include cam phasing and variable displacement. 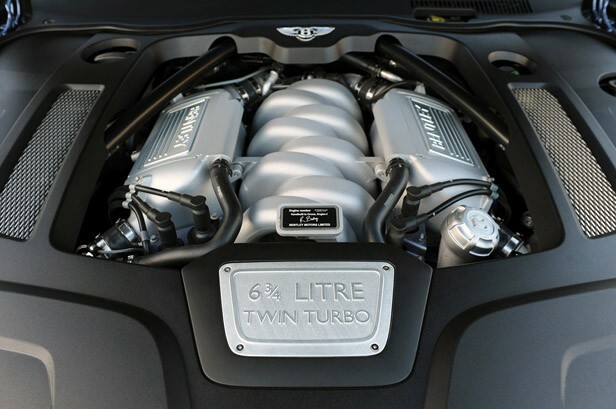 Bentley boasts that the engine now generates 505 horsepower at 4,200 rpm – and that's the least impressive part of the tale. 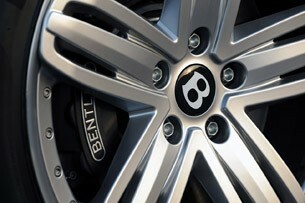 More significant is the devilish (and mind-boggling) 752 pound-feet of torque available from just 1,750 rpm. Somehow commendably tolerating the power is a standard is a ZF eight-speed automatic transmission with steering wheel-mounted "paddles" for manual control. 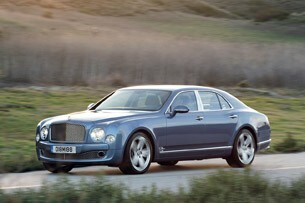 According to the automaker, the Mulsanne sedan will reach 60 mph from a standstill in just 5.1 seconds. Keep your foot down for 11.6 seconds, and the 5,700-pound four-door will hit 100 mph (despite toting nearly double the weight, this buffed beauty is quicker than a Porsche Cayman S). Once under way, the sound of the engine and exhaust is terrifically muted during steady motoring, as if the powerplant is somehow operating in the vacuum of space. The absence of engine noise on the highway is eerie, but understandable. As mentioned, the Mulsanne is the first vehicle in its segment to boast variable displacement – valves close in four of the cylinders to maximize fuel economy during cruising. The powertrain function isn't new, as many automakers have embraced so-called "cylinder deactivation" technology over the years. However, we've never experienced such a transparent transition between four and eight cylinder operations (if Bentley hadn't put it in the written press release, we'd swear it didn't happen). 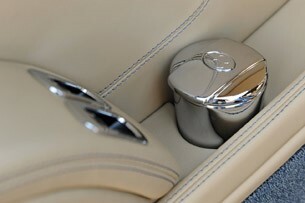 As a driver's vehicle, Bentley has made special provisions for those behind the wheel to alter suspension and steering responses with a rotary switch found near the gearshift lever. Of the four modes (Bentley, Sport, Comfort and Custom) we found "Bentley," the setting reportedly preferred by the automaker's engineers, as the choice selection. It seems to offer an admirable balance between chassis float and unnecessary harshness. We stumbled upon potholes seemingly large enough to stage a motorcycle jump – the Mulsanne glided over each with poise and dignity. When the road turned twisty, the Bentley didn't quiver. Despite its mass and weight, the flagship sedan handled impressively. 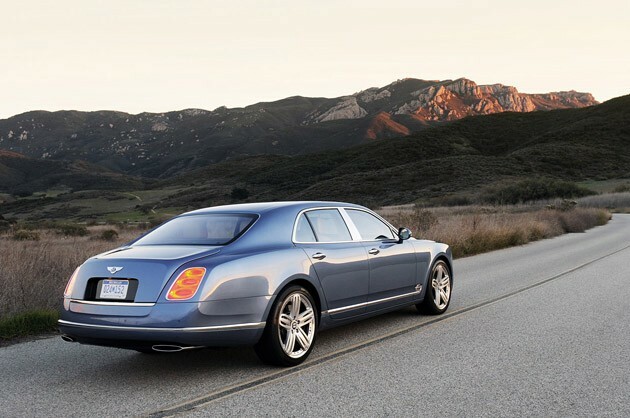 We spent countless hours on small two-lane back roads, all the while astounded as to how well the nearly-three-ton Mulsanne conducted itself. While not directly marketed as such, the Mulsanne would unquestionably embarrass the majority of the self-proclaimed "sport sedans" on the market today. And then there's the prodigious power. Wheelspin from a standstill is a no-brainer, but it is rather unbecoming (as are cartwheels from 60-year-old women, regardless of their physical appearance). It's best to show some restraint and depart with a gentle foot. Instead, press the accelerator pedal down about one-third of its travel while cruising on the highway and something awakens from deep within. An audible noise, possibly not unlike that of a grumpy prehistoric wooly mammoth trapped inside an aged oak whiskey barrel, emanates from the other side of the firewall. It's a low and deep grumble, distant but with authority. The change in audible pitch is accompanied by the entire front end of the Mulsanne lifting a few fractions of an inch as all that weight transfers rearward. Then, without further ado, the big sedan is rocketed down the highway. 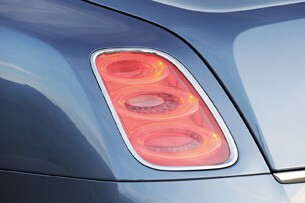 The experience leaves surrounding vehicles off in the distance, and those in the Bentley grinning from ear-to-ear. 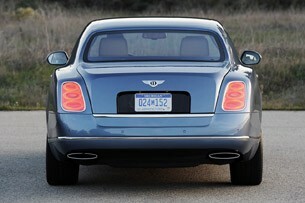 As expected, the Mulsanne wears mighty brakes. Its iron rotors (two-piece units) are 15.75 inches in diameter up front with six-piston calipers, and 14.60 inches in the rear with two-piston calipers. The optional 21-inch wheels wear 265/45ZR21 performance rubber, affording the four-door plenty of adhesion. Stomp the brakes and the nose drops as weight transfers forward (along with everything else). Prior to deceleration testing, cinch all seatbelts and secure loose articles within the cabin. The brakes are very effective. Without question, the Bentley Mulsanne delivers an extraordinary driving experience – every bit as grand as one would expect, particularly given its lofty price tag. The big four-door is comfortable on the highway and capable in the corners. It accelerates rapidly and bleeds of speed without drama. However, the mechanical operation of the machine is only one part of its charm. It's so much more than adept transportation. 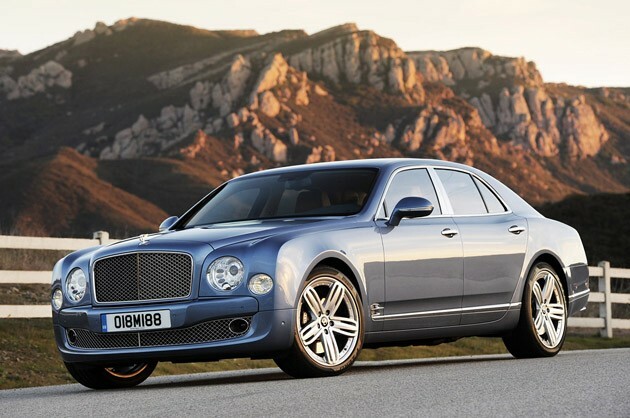 The Bentley Mulsanne represents nearly a century of coachbuilt automotive history. That heritage is ingrained in the aluminum body panels, stainless steel adornments and dyed leather hides. 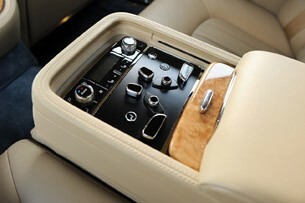 Countless man-hours are embodied in the upholstery stitching, hand-polishing and laborious inspection of every pore. 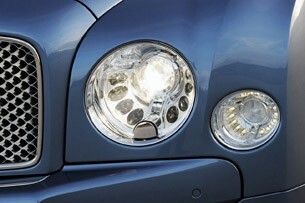 The Bentley Mulsanne, arguably the world's finest luxury automobile, is a piece of rolling art. It reflects the owner's character, individuality, passion and financial worth. The hand-crafted sedan speaks volumes about those behind its wheel, yet it doesn't utter a single word.